After 10 days on this wild adventure I figured I'm blessed because I've not seen one roach. A couple of days after arriving I heard a girl mention they had a "potato-sized hissing cockroach" in their room the night before. The visual image stuck with me. The bugs I've escorted from my room have been manageable, but today when I got back to my cabin in late afternoon, there were ants all over my door, the door to the bathroom across the hall, the walls and a 2" wide moving strip up and down the stairs to the floor above. I've had ants traveling along my door with some popping in now and then to check out the accommodations since my arrival, but they've not been intrusive. I've escorted them out individually as I have with the other insect visitors. Tonight they were all over my room in "globs". They had a 1 inch wide strip from the door under the shelves on that side of the room and then some of them marched ahead to the side wall behind the desk and on to the bed, which was only a couple of inches from the wall. 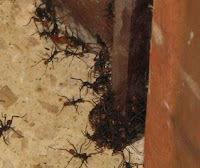 Since there are 500 species of ants here at La Selva Reserve, I have no idea what these guys call themselves, but this "moving experience" made me flash back to a day in 1971 when I returned home from work to find my kitchen full of roaches. I had lived there for a few months and not seen any so it was simply horrifying to me since I was terrified of bugs back then. Ants, flies, moths ... anything considered a bug reduced me to screams and tears. When they came to "take care of the situation" they determined that the person who had moved upstairs less than a month ago was breeding them with her housekeeping habits (or lack thereof). She was a nurse who apparently had nighttime hours, so I guess they felt the house was their domain while she was gone. I moved. They allowed me to break my lease since I was so emotionally unstable about the whole nightmare. Gee ... to think how far I've come. Well ... not far enough to spend the night with a zillion ants crawling all over my room. These weren't those tiny little things I've found around the pet food bowl. These were large rainforest ants with long legs. Three inches long! Okay ... just kidding, but they are large ants. The experience had me flashing back to the roach nightmare, but I reminded myself these were ants and they seemed to mean me no harm. A distraction of some food might provide a place for them to move on to dinner, so I put out a small jar of peanut butter that I had in my pack from the city. They had a long path on the walkway outside the building so I put it about 4 feet down that walkway and made sure a few ants checked it out. Not interested in the least. These were obviously worker ants that had "food that I knew not of." I left it there hoping they would get an appetite and relocate. Thinking that reasoning would make a great offensive play, I informed them that this room was off limits. I had been gentling stepping around them for the 10 days I've been here and was still doing so although the task had now become quite the challenge. Using the bathroom wasn't any easier since they were in there also. Having been a tip-toe gracious host, I told them I expected them to "step around" my room. I didn't know what they were looking for, but there was an obvious order to their inspection, so I said I would be returning in a few hours after dinner and expected them to be finished with whatever they were up to. Naturally I added some prayer to that request and gathered up my things and headed out the door so they could humbly retreat without having to do so in front of me. After all, they had a grand mission going on and certainly didn't want to back down for one human being. With me entertained elsewhere, they could simply choose to march some place else and save face. My mind lingered back at the ant hut as I wandered around the grounds. I wondered if they were crawling over my toothbrush or if they would find their way under my sheets, but I kept hoping they would be agreeable to my demands. When I returned from dinner there were only a few on the bathroom door and inside the bathroom, however, I got a 3" millipede on the wall as an exchange option. Maybe he had chased them out. The line was still heavy on the stairs and in front of my door, but there were only a few crawling on the door. I wasn't sure I wanted to enter my room. I noticed that they were bringing white globs down the stairs, and viewing with my flashlight, it seemed to be some larval form of ant. There were 2 ants carrying each of them. Maybe they were having to move a nest for some reason. I put the key in the door and went in to find that they had completed 95% of their inspection. They were still along the wall within a foot of the door, but had cleared out of the rest of the room. I was grateful, but still had that icky feeling about the whole event. That's when I decided to write this post for the blog. Something to get my mind off my thoughts. To have an end of the story, I left my computer to check on the status and can now only find 5 ants in my room. That's acceptable. I opened the door to see if there were any less in the hallways, I was amazed to find none. The entire highway of ants that I saw going up the 7 stairs and continuing around the corner is gone! That's incredible! That is as freaky as them being there. The amazing world of ants! It will surely give me something to think about as I drift off to sleep. Earlier I was wondering what it would be like to sit in bed all night awake watching the walls and floors move. Feels great to able to say, "Good night!" P.S. Read follow-up about Army Ants.